Human Urinary tract starts with filtering of blood from the kidneys. As kidneys excrete urine into collecting system from where urine passes to the renal pelvis and through 2 tubes called ureters to Urinary bladder. 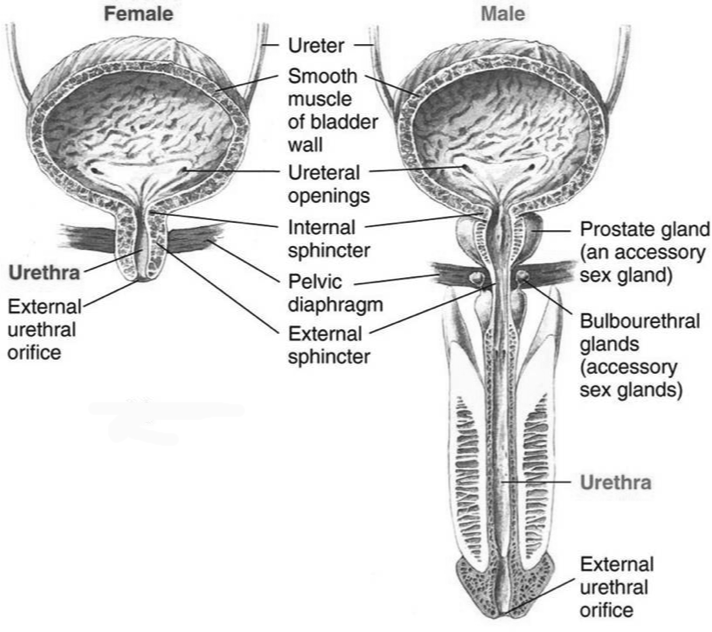 Urinary bladder is a dilated balloon like structure which can store urine for a temporary duration. 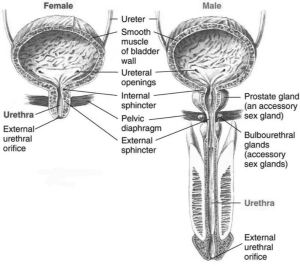 Normally, human body had 2 sphincters ie valve like structures in the urinary tract that regulates the outflow of urine and maintains the continence. This prevents dribbling or inappropriate flow of urine. One such sphincter cal led internal sphincter is situated at the outlet of the Urinary bladder which is involuntary type. The other is situated at the lower level as shown in the picture and is voluntary type and is under control of a person. The urination process is controlled by the nervous system. The coordination of this system along with person voluntary relaxation of external urinary sphincter cause urination. Urinary incontinence (UI), the involuntary loss of urine so severe as to have social and/or hygienic consequences for individuals and/or their caregivers. ( source: Medscape ). The inability to hold urine with inappropriate release of urine or dribbling or leaking of urine continuously is called Urinary incontinence. This problem causes persistent wetting of undergarments and is a social and personal hygiene problem. Women and Old age people, and people with neurological disease are at risk of urinary incontinence. Affected daily life style and confidence. Specifically in old age, weak bladder muscles, Overactive bladder muscles, Damage to nerves that control the bladder as in multiple sclerosis, Parkinson, Paralysis, Blockage from an enlarged prostate in men and chronic illness. What are types of Incontinence? Stress incontinence occurs when urine leaks as pressure is put on the bladder as during exercise, coughing, sneezing, laughing, or lifting heavy objects. It’s the most common type of bladder control problem in younger and middle-age women. It may begin around the time of menopause. Urge incontinence occurs when there is sudden need to evacuate urine. Generally patient is not able to hold their urine long enough to get to the toilet. They are the people with diabetes or other neurological issues. Overflow incontinence occurs when small amounts of urine leak from a bladder that is always full. 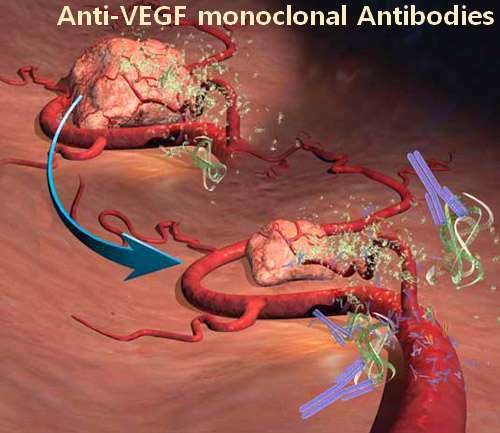 Causes include enlarged prostate, Diabetes and spinal cord injury. Functional incontinence occurs in many older people who have normal bladder control. The problem lies in getting to and using the toilet when the need arises. Your first job, if you have such issues is to visit a doctor. There may be various underlying causes for it and you should not sit back and rely on online health portals. There is no replacement to clinical assessment and treatment. Besides the medical care, supportive care will have you improve your lifestyle. With Underwear like elastic . Easy to wear and remove for elderly as well. A good adsorbtion system that can prevent leakage of urine as well. Soft leg passage with flexible opening for legs. Open it wide & put your legs into the passage. Pull it up till knee and then pull it up all the waist. For removing, simply tear off both sides and just take the diaper out. 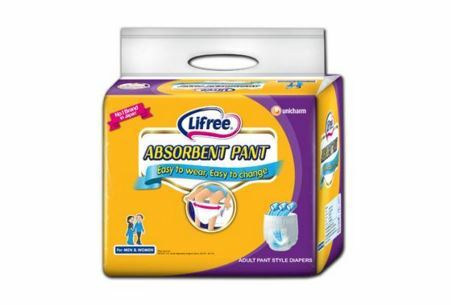 These diapers are promising for people with problems of incontinence and Lifree has provided a lead to the solution in Indian subcontinent. The superb absorbability, Leak proof feature, and light weight and pant type feature cause this diaper to be a specialist in this care. Writer- Mr Kumar , a regular health writer who writes for medical and health blogs. Nice article on urinary incontinence. Not just children, reproductive age women and people of old age also often have soiling problem. And yes using term diaper often cause stigma, Pants sounds a better term. I am a Adult critical nurse myself. Incontinence is more of problem in old age people. Constant smell causes loss of quality of life. Thanks for sharing this. With the large number of possible causes for urinary incontinence, the first priority should always be to visit a doctor to be certain it isn’t something incredibly serious. If it’s nothing too devastating, there are enough options for treatment that the person can choose what’s the best fit for their situation and lifestyle.